Ear infections cause sharp, intense, dull, or piercing pain. You might detect them at once, or you can struggle to discover the reason why your child cries and tugs the earlobe. Earaches are always a painful and unpleasant issue, which often makes you try all that you can find in the medicine cabinet, even antibiotics, in order to soothe the pain and discomfort. However, you do not need to use antibiotics to alleviate an earache, as you can treat it completely naturally. The newest guidelines from the AAP are that an earache should be treated by focusing on the pain management, instead of using antibiotics. In most cases, ear infections go away on their own, and antibiotics can lead to antibiotic-resistant infections. The most common causes of earaches include cavities, tonsillitis, sinus infections, and teeth grinding. The most common infection is acute otitis media or AOM. It is manifested by infections and swellings of the middle ear. The pain is caused by the trapped fluid behind the eardrum. Its most common symptoms involve fever, slight hearing loss, earaches, or feeling sick. In the case of small children and babies, you might detect it if they are restless and pull the ear. Cut the onion in halves and place one half over the painful ear. You can also warm the onion and tuck it into the ear. You can also place the onion directly in the ear, or wrap it in a warm cloth. Keep the onion compress for 10-15 minutes, or until it cools. Moreover, you can squeeze the onion juice and heat it up. Then, apply a few drops into the ear. You should soak a cotton ball in it and add a few drops into the painful ear. This will dislodge the debris, and you can irrigate the area with warm water afterward. Apply a few drops of the tea tree oil in the ear. The potent antibiotic and analgesic properties of garlic can effectively soothe the ear infection. Add a teaspoon of minced garlic to 2 tablespoons of some oil and heat the mixture. Apply 2-3 drops in the painful ear. Apply a few drops f apple cider vinegar in the ear and leave it to act for a minute. Repeat after 10-12 hours. Ginger has powerful anti-inflammatory properties which soothe an earache. 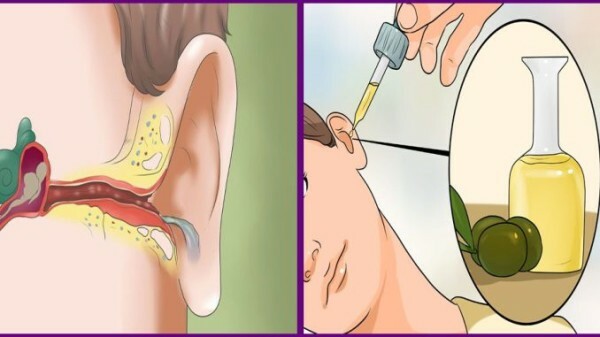 You should apply a few drops of the ginger juice into the ear. Also, you can heat ¼ cup of sesame oil with a tablespoon of fresh ginger root, and apply it around the painful ear. This is one of the most effective remedies in the case of pain in the ear. You should heat 3 tablespoons of sesame oil, and add a teaspoon of bishop’s weed oil to it. Then, put 4-5 drops of the warm oil into the ear. You can use hot water bubbles to treat an earache, or you can prepare heat packs and apply them to the ear. Place popcorn or rice in a small pouch or old sock, seal, and heat in shorts bursts. Then, hold the pack on the affected ear. Basil has strong antibacterial and anti-inflammatory properties of basil, so you should extract the juice from several crushed basil leaves, and apply a few drops into the ear. The olive oil can be used as a lubricant and provides fast relief. Also, it can stop the buzzing sensation inside the ears. You should heat it a bit, and apply a few drops into your ear canal.